The idea of the King holds great power in the West, even when actual kings and queens largely do not. For us Westerners, what the Emperor means comes from Rome through Charlemagne and Otto I. There is a mythical undercurrent however, that is far older. The Empire was not a state, but a system of dispensing justice. We find that lucid formula near the end of this sprawling book by Friedrich Heer (1916 – 1983), the great Austrian authority on intellectual history. The formula is welcome, since there has always been some mystery about what the Holy Roman Empire was, as well as about what it was supposed to be. However, just as the formula comes late in the book, so it best applies only to the final phase of the empire, when the emperors were preoccupied with the defense of their solid Habsburg possessions in Austria and Hungry, and the empire was a sort of German United Nations that functioned through the Perpetual Diet of Regensburg and through the imperial courts. Even in the 18th century, however, the empire never lost its connection to the days when the emperors were priest-kings, who reflected an even more primordial past. And indeed, just as there is some mystery about what the empire was, so there is some mystery about how to characterize this book. Heer's work is like a good film adaptation of a complicated adventure romance: it is filled with lyrical language and splendid images (wonderful graphics in this book, by the way), but it is really an illustration of the story rather than a retelling of it. A full history of the Holy Roman Empire would be almost a political and intellectual history of Europe. This “History of the Holy Roman Empire” is set out chronologically, and most of it is a narrative of the reigns of the emperors, but the effect is almost of a cycle of prose poems. There are key dates and events in the political history of the thousand-year empire, naturally. The Roman imperial title was revived, or created, for Charlemagne in 800, and survived the rapid disintegration of his empire. Eventually it passed to Otto I, who was crowned in 962, which in many ways was the real beginning of the Holy Roman Empire. It was a largely, but not exclusively, German league of princes, bishops, and municipalities. All were under the authority, if never quite the control, of a nominally elective king. The fundamental constitutional text of the empire was the Golden Bull, issued by Charles IV in 1356. Among other things, the Bull fixed at seven the number of imperial electors, the college of lay and ecclesiastical lords who elected the emperor; their number eventually rose to nine. In 1555, at the end of the reign of Charles V, the first round of the wars of religion ended in the long truce of the Peace of Augsburg. Through a combination of malice and stupidity, the truce collapsed into the Thirty Years' War in the next century. The war (wars, really) ended with the Treaty of Westphalia in 1648, which made it possible for Catholics and Protestants to co-exist in the empire. The cost was a broad and precise definition of the rights of the German principalities that prevented the formation of a national German state. The empire was dissolved, under pressure from Napoleon, by the Emperor Francis I in 1806. Heer repeatedly assures us that the dissolution was beyond the emperor's power, and illegal; he's probably right. The difficulty with telling the story of the Holy Roman Empire is that all the verbs and adverbs are attached in every generation to different nouns. The empire's center of gravity was generally in Germany, or Austria, but sometimes the emperors identified more with their possessions in Burgundy or the Netherlands, or in Bohemia. Charles V, the first ruler on whose domains the sun never set, was as Spanish as he was Burgundian or Austrian (though the Spanish Empire and the Holy Roman Empire were coincident only in Charles's person). The hold of Charles's family, the Habsburgs, on the imperial office was almost secure in the last few centuries of the empire. The various branches of the Habsburgs perfected the art of being everywhere present and nowhere a foreigner. The fact of being cosmopolitan did not make the Austrian Habsburgs chiefly concerned with protecting their most cosmopolitan title, however. They cared for the empire, just as they cared for their other possessions. At the end, though, they could let it go without diminishing their house's real power or influence. Despite the empire's protean geography, there were some basics that all emperors struggled to retain. They all protected the jurisdiction of the imperial courts, for instance, and they all tried to secure communications through imperial territory. There was a small number of imperial rights they insisted on keeping, and to a remarkable extent they succeeded. Political theory is relevant to the study of the empire, obviously, but the empire stays in our minds because it is where all those emperors in European fairy tales come from. Heer does not cease to remind us that the symbols and the functions of the emperors go back 5,000 years, to the first city-states with their eagle emblems and god-kings. The emperor was in some sense a universal ruler, in dignity if not in fact. His archetypical claim to deference had nothing to do with his power. They emperors always did certain things. They hunted. They cured by touch, at least reputedly. They protected the Church. They made peace. More precisely, they had the duty to give peace. Also, the emperors, and the empire as a whole, were the restrainers of Antichrist. (Curiously, Heer does not cite II Thessalonians 2:7.) The German emperors played this role when they defeated a Magyar invasion of the West in 955 at the Battle of Lech, and thereby created the sense of “Germanness.” They played the same role six centuries later, when they were the only European rulers to offer serious, systematic, and ultimately successful resistance to the Turkish jihad aimed at central Europe. According to persistent myth, when the Emperor of the Last Days lays down his crown at Jerusalem after finally defeating Babylon, then the Antichrist will appear. Sometimes, of course, the emperor was Antichrist, at least in the opinion of the pope. The tension between holy empire and holy church, both claiming divine sanction, runs right through the history of the West. Heer points out that the largely successful campaign by the popes of the 12th and 13th centuries to desacralize the empire was the basis of every other claim of right that would ever be made against the state. It also meant that the Church, the City of God, would eventually become just another political body: society as well as the state was ultimately desacralized. 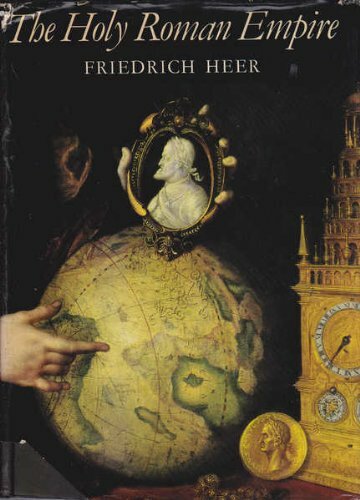 Interesting as the medieval material is, Heer's book is most valuable for its treatment of the period after the Treaty of Westphalia. He points out that the empire's only “native style” was the baroque. Baroque art, politics, and philosophy were employed by the empire (and also by the Catholic Church) to preserve the world of images that the Reformation had begun to destroy. The high baroque was a “festival culture,” colorful and profligate. Underneath the gilt and gemütlichkeit, however, there was an unshakeable foreboding. In Heer's telling, the good humor of Mozart's empire was an expression of the understanding that life is based on sacrifice, on self-sacrifice, which was to be carried out with style and without complaint. The music, the painting, and the overwrought architecture all reflected this. The result has never been to everyone's taste. Had Heer lived longer, he might not have been surprised that post-Habsburg Eastern European cities became the locales of choice for horror films. The end of the empire as a political entity was overdetermined. Among the specific causes that Heer points out, I might mention just two. One was the theft of Silesia by Frederick the Great from the Habsburgs. The province was not that important to Austria, but it gave Prussia (which was founded by the Imperial Elector of Brandenburg, by the way) the human resources to carry out the long-term project of hegemony in Germany. More important was the fact that the emperors themselves were turning their backs on old Europe. The greater cause of the empire's end was internal. Before the beginning of the age of mass revolution, the Enlightenment encouraged revolution from above. The 18th century was full of reforming despots, among the most radical of whom was the Holy Roman Emperor Joseph II. He expropriated Church property and regulated the clergy in a way that the French Revolution would only imitate. He expanded the rights of religious minorities within his own territories. He attempted to elevate the peasantry, especially in backward Hungry, from serfs to freeholders. He promoted education and manufactures. And when he died in 1790, he realized that he had largely failed. One could easily extend that chain of influence to people like Francis Fukuyama, and to 21st century transnationalism and neoconservatism. The empire has its patriots still.